If you're unhappy with the consistency of wood poles, but can't justify the cost of steel or concrete, McWane Ductile Iron Poles are the perfect solution. DURABILITY McWane Ductile Iron Poles have a service life of 75+ years, outlasting both steel and wood. LOW MAINTENANCE Strong, lightweight, and corrosion resistant, McWane poles are resistant to rot, insects, freezing weather, and woodpeckers. CONSISTENT STRENGTH Unlike wood, our ductile iron poles are engineered with a minimum yield strength of 42ksi. 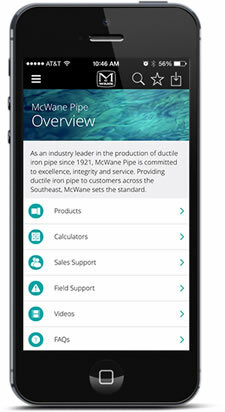 LOW LIFE-CYCLE COSTS McWane ductile iron poles cost less than steel or concrete alternatives. SIMPLE INSTALLATION Ductile iron poles can be easily drilled. The round, tapered design simplifies orientation for installers. CONSISTENT APPEARANCE Manufactured by centrifugal casting, McWane Poles have consistent dimensional control and will not warp over time like woods.